This application could also be called “Feeder Sizer” as it provides all information required to size feeders. Colour coding of maximum allowable ampacity values – according to CEC or NEC – helps choose the correct wire size. 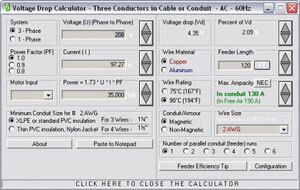 Voltage drop values are updated on the fly, conduit size is shown and if you size the feeder for a motor, Full Load Ampers for typical motors are built-in. With rising cost of electricity you may find the “Feeder Efficiency Tip” useful. It informs when it may be beneficial to increase wire size above the minimum required by code. Helps select proper wire and conduit size. Estimates full load current of motors based on Horse Power rating. Enter values in any sequence. Has built-in NEC & CEC wire ampacity tables for US and Canada. Prints results. All terms and definitions are explained on screen. No manual required. Calculates the cost of energy lost during feeder operation.